The normal sunny Brighton parkrun deserted us this week. It was cold and raining hard before, then during and finally afterwards – not nice. With that scenario in mind a huge big thanks goes to the volunteers on Saturday all 25 of them. From the Organising team, to the marshalls on the course to the Duke of Edinburgh youngsters braving freezing, wet hands to scan all the runners through the finish funnel, all with good grace and big smiles. That makes a total of 1,580 volunteers here at Hove Park, volunteering 12,998 times.!!! The heroes this week were: John MASON • Caroline WOOD • Mark STEPHENSON • Paul STRATTON • Michael HOWARD • Kian DOYLE • Ronan DOYLE • Malcolm ROWETH • Cheryl SACKS • Diarmuid (Dee) O'HARE • Joel Adam LUSCOMBE • Monty JACKSON • Simon PORGES • Daniel PORGES • Euan HANNA • James CORNFORD • Henry COPPARD • Jon BINNEY • John ADAM • Alice BURTON-BRADFORD • Julie ZHU • Yao HU • Oliver BRYANT • Dorian COTTAM and John P DOHERTY. These include someone taking all the Hi-Viz home, washing and drying them ready for next week. Someone taking the finish barcodes home and drying them, making sure they are all in order for next week. There were 243 across the line varying from 15mins 41ses to the tail walkers in 52min 25secs. We had 21 running parkrun for the first time – Welcome to all of them, we hope to see you again soon. There was a fierce battle up front with the first three finishers 70 secs in front of the rest of the field. Thomas Niner (B&H) led home Ben Savill (Croydon Harriers) and Declan Neary (City of York AC), all producing PBs. Georgie Anderson (Hove Hornets) led in the ladies in front of Cheryl Sacks. 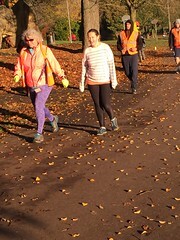 Whilst running her first Hove Park run she has run about 140 different parkruns in her 297 runs, with an impressive 135 volunteer credits. She might be getting this parkrun thing! Third lady finisher was Geraldine Tyler (Hassocks) just 5 secs off her best time. Thanks to all volunteers and parkrunners for making this a special Saturday. Whilst it was good and enjoyable in a weird sort of way, we would prefer drier condition for this Saturday. Winter has well and truly arrived! It was a wet and cold Saturday morning when 324 people turned up for the parkrun – a bit of a difference from last week! The briefing was kept short (just like this report) and you were off. The first three home were Andrew McCaskill in 16:15, John Stoddart in 17.08 and Adam Tribe in 17.37 – well done guys. The first three women home were Mel English in 20.50, Kelly Tingey-Russell in 21.45 and Maria Lovegrove in 22.55 – well done you three!! We have some amazing junior runners here at Hove Park. Thomas Matthews (JM10) did his first ever parkrun in 19.42 and Beth Davidse (JW11-14) came in at 23.14. Fantastic running both of you. Out of 324 participants, 11 were first timers and 37 got PB's (that's more than 11% of you running faster than ever before!! - surely it can't have been down to the weather). I didn't read out any mile stones on the day, so here they are. Tom Hutchinson ran his 100th (and achieved a new PB!!) along with Paul McCarthy and Alex Rawlinson. Kathryn Anderson and Neil Ford both ran their 50th. The race is on now to see who can get their milestone shirts first. Whilst we're on the subject of the Christmas / New Year period, we will be hosting the double parkrun on New Year's Day at 10.30am, following the parkrun on Hove Prom at 9am. 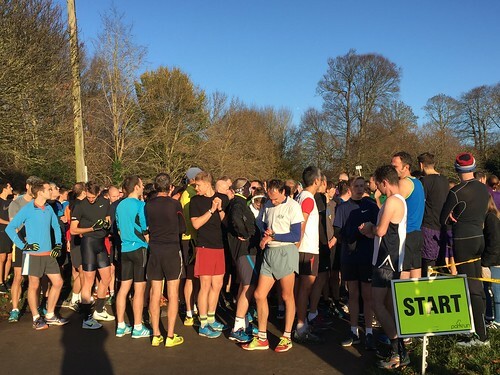 Preston Park will be hosting the local Christmas Day run at 9am. You'll be able to rack up 5 runs in 2 weeks if you do them all! However, these can't run without volunteers so if you could consider volunteering for one out of the 5 then please email brightonhelpers@parkrun.com – we'd be most grateful. What an amazing day to see parkrun at its best - 614 people including a duck and a chicken ran, jogged and walked the course this week on the most beautiful of Autumn mornings. Congratulations to the 169 runners who were first timers including a significant number from the Vegan Runners running club– we hope you enjoyed the run. Further congratulations to the 64 runners who recorded new Personal Bests. Ken Crellin has achieved three PBs in the last month, Xanthe Cox knocked off 1.5 minutes from her time and Ruth Farnell took over 2 minutes off her time achieving an age rating of 77%! Betsy Brooks has now completed her last volunteer session for her Duke of Edinburgh silver award – a commitment of 6 months volunteering is impressive Betsy – thank you! Jonny began running at Hove Park in May 2016 marking the start of his road to recovery from somewhat troubled times. Cliff Evans introduced him to running and after a short time, Jonny ‘caught the bug’. With the help and support of Matt Lambert, he then began running more seriously with Hove Hornets and entering races. 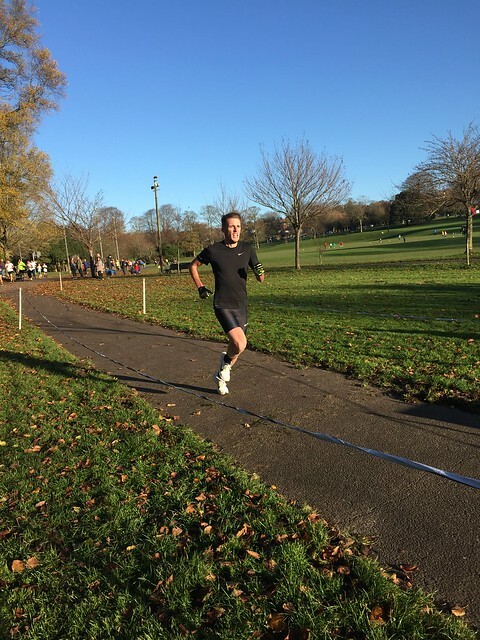 Jonny’s first Hove Parkrun saw him achieve a time of 32:31. Since giving up smoking this year and committing himself to more training, he has recently recorded a time of 21:48. Brighton & Hove parkrun started on 3rd November 2007. Since then 18,751 participants have completed 185,509 parkruns covering a total distance of 927,545 km, including 31,457 new Personal Bests. Good luck to those of you running the Brighton 10km on Sunday. What a memorable parkrun it was this week – with chilly cheerers, milestones met and records rocked, as you’ll see below …. We always welcome new and experienced volunteers – why not try it out by sending an emal to brightonhelpers@parkrun.com with your name and date to volunteer? Everyone is welcome to volunteer at any time, and there are roles to suit everybody, whatever your preference. When you put your name down to help, we post it onto the roster which you can see at http://www.parkrun.org.uk/brighton/futureroster/ Go on - give it a try. 466 people ran, jogged, fartlekked (!) or walked this week. Of these, 31 were doing their first run at Brighton & Hove, and 61 recorded new Personal Bests. Several runners completed milestone runs today. Top of the milestone charts are Camilla Moyle, James Adams and Julie Drake (with her ever-enthusiastic dog Amber in tow …. or should that be Amber with Julie in tow?) who each ran their 250th parkrun this week. Camilla was one of that select group of runners who completed the first ever parkrun at Hove, back in 2007 (and, of course, she hasn’t aged a day since then). Well done, all three of you, on a great achievement which is also a symbol of your dedication to parkrunning. 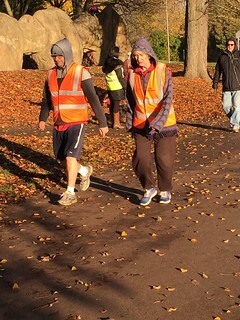 Not far behind are Hove park regulars, Val Poole and Angela Robinson, who each ran their 200th parkrun today, while Nick Culliss completed his 100th. Well done, all of you, for keeping on keeping on for so long. And this week, 50 is the new – well, the new red t-shirt – for a veritable plethora of parkrunners, with eight people achieving that milestone. Congratulations to Phil Fanthome, Jan Measor, Trevor Muten, Valerie Spence, Amaliya Coburn, Louise Lawrence, Mike Digger and James Graham. Among our junior runners, Ben Laux and Josie Elbourne each completed their 10th runs today, which means they are now able to claim their white 10 t-shirts. Not only did Ben and Josie complete their 10th parkruns, but they each got a PB to boot! Good running, Ben and Josie – keep it up, and wear your t-shirt with pride! 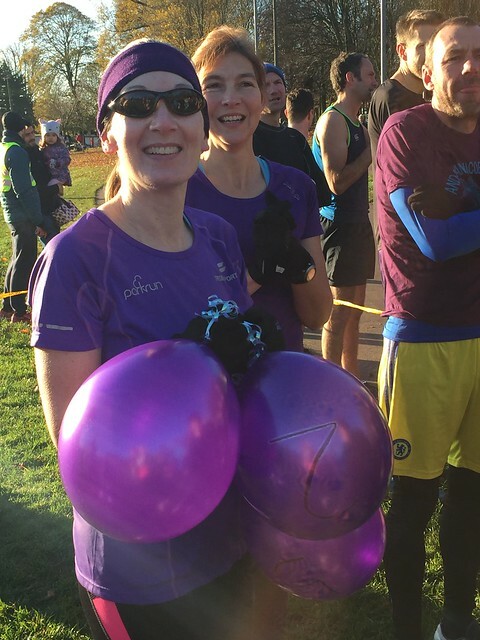 And lastly in this section, these milestone moments took on a special meaning for Camilla and Julie who, along with friend Louise Lawrence, ran their 250th in memory of Camilla’s brother Chris, who would have been 50 on Sunday. Chris was a regular parkrunner, and a good friend to many at Hove Park. It’s a testament to Chris’s character that his memory is kept alive by those who knew and loved him. ]]>Many of us at parkrun are looking to achieve that 50th or 100th run, or that elusive PB, or whatever it is that floats our boat. And while parkrun isn’t just about being speedy (definitely not in my case! ), we do admire those who seem to fly by at super-human pace. With that in mind, congratulations go to Charlie Grice of Brighton Phoenix who smashed the course record this week, taking a full 3 seconds off the previous record to finish in 14.25. Charlie managed to run faster than the other 16,683 people who have completed our parkrun in the 10 years since its inception – pretty impressive, eh? And for all those of you who are thinking “No way! How can he possibly run so fast?”, the answer seems to be a combination of talent, determination and seriously hard work. Although Charlie makes it look like the proverbial “walk in the park”, he must surely have pushed himself the whole way to achieve that amazing PB. Well done, Charlie! Second and third over the line among men today were Graham Godden (16.46) and Patrick Acaye (17.10). For the women, the 1-2-3 were Tara Shanahan (19.31), with Cat Bounds (with a PB of 19.43) and Lucy May Richardson (20.30). Good running all round. Finally, a quick mention for Oliver Pendlington of Hove Hornets whose recent improvements in form are amazing. Oliver has been a frequent parkrunner for over four years, regularly completing the course in around 21 or 22 minutes and with 130 prkruns under his belt. I don’t know what his new regime is, but recently his results have rocketed: he has completed parkrun every weekend this month, achieving a new PB every single time, finishing this week in just 19.19. Way to go, Oliver! Have a good week, all, and see you in the park on Saturday. Since we held our first parkrun in Hove Park on November 3rd 2007 we have seen the event grow from the original 17 runners (who have gone on to run 2,178 times! ) to the record attendance of 633. We have seen 16,610 individual runners from a total of 707 different clubs, running a total of 812,420 kilometres. We were the 6th parkrun to start and the first South of London. Since then we have seen the rise and rise of parkrun to over 1000 parkruns! Also we happen to have the second longest serving Event Director in the entirity of parkrun! This Saturdays parkrun saw the 525th version with 461 runners braving the potentially, horrendous weather. As it turned out the rain held off during the 10th anniversary speech but come back midway through the run. It didn’t deter the tourists from Egdon Harriers, Weymouth , Oxted , Pembrokeshire, North Bristol , Old Hatfield ladies from Aylesbury and our regular tourists from Horley. Hope you all had an enjoyable run. We had a number of runners reaching their individual milestone. Joining the Junior club 10 is Lucy May Richardson. Alison Dewdney, Griz Phillips & Andrew Neighbour running their 50th, Rick Crockett his 100th, Adam Dudley his 150th and the old stalwart Tom Fallon reaching his 300th! Well done to those runners. Behind the success of parkrun, in general, and Brighton & Hove parkrun in particular is the army of volunteers who, each week, enable the runners to run and be timed in a safe and happy environment. This week the 44 volunteers listed below excelled themselves again. This brought to total the different volunteers over the last 10 years to a magnificent 1416 ! Running wise the first over the line this week was Spencer Thomas in 15m 18s shadowed by Archie Davis (Phoenix) 1 sec later in a new PB, Leo Brewer completed the top three in 16m 54s. The first three ladies were only split by 21 secs. Freya Leman of Hove Hornets in 20m 33s, followed 6 secs later by Fiona Blackledge, Vegan runners with another Hornet, Helen Wilkes in 20m 54s. They were all just outside their PB’s so something to work at. The record times for our course haven’t been challenged for quite a while. The male record of 14m 28sec has held firm for 220 weeks while the fantastic age graded record of 94% was achieved 325 weeks back in week 200. However the longest held record is the Female record of Caroline Hoytes She achieved the 16m 43s in week 84. It will be interesting to see if the times come down in the next 10 years. Finally I must pay homage to all the volunteers who have contributed to your enjoyment over the last 10 years. Back in the early days Matt Bristow, Richard Carter, Chris Carter, Shaun, Andy, all contributed. The core team, who keep things running now and all the more than 1400 other volunteers who selflessly give up their Saturday morning for the sport of parkrun. Here’s to the next 10 years ! Just wanted to say that one of the Pacers came up to me today re the Pacers... he said that sometimes runners go passed and shout - that's too fast or too slow... which when you are pacing isn't helpful as they already know what they are doing, and will adjust accordingly..
We all have a banter re pacing ( Brian knows about this only too well - sorry Bri!!! ), as we know the Pacers, they are friends but yes it is off putting when you are trying to do the job in hand.
! We put the pacing role in as a gesture, so that you can use parkrun as a training event, beat your own PB and make new ones! The January – March 2017 issue of the RunABC magazine for the South will be given out for FREE tomorrow Sat.December 10th at Hove Park. This issue includes articles on Club La Santa (not the Christmassy one), the new phenomenon - Virtual running events and winter running shoes. News items include a report of the 950th anninversary run over at Battle, a good piece on our very own Carol Grant. That is along side regular features of running Log, retailer listing and a comprehensive race listing for the next three months. For a lot more information see www.southernrunningguide.com. We will have volunteers to hand these out to you, especially the newer runners. The August/September 2016 issue of the RunABC, South, magazine will be given out for FREE tomorrow Sat.July 23rd. at Hove Park. There were a couple of anomalies in the results this week and two points to be made!! It appears that a male runner had a female barcode scanned and ended up third female! Mistakes do happen and I would hope in this case that is what happened. If that isn't the case please email Brightonoffice@parkrun.com and we can sort it out. The rule 'No barcode No result No exception ' applies but the barcode you have must be your own barcode! We are pleased to announce that the winner of the Sweatshop Award for October is DANIEL PORGES (JM11-14). You might be forgiven for thinking Daniel is relatively new to parkrun, as the number of runs he's completed to date has not yet earned him his magic 10 T-shirt - but in fact his contribution to our local event has been longstanding, as he turns up most weeks to help out. He has clocked up over 20 volunteering sessions in recent months, mainly marshalling and being the gopher boy, tracking runners along the funnel, checking names and and tag numbers, feeding back info to the timechecker at the finish line. But of course the Sweatshop prize is all about the running, so we will be sure to see Daniel doing more of it now, having resumed his parkrun career just last week! Our congratulations to Daniel, who will be claiming his next pair of trainers from his local branch of Sweatshop very soon. Daniel also gains the distinction of being the last ever Brighton & Hove parkrun winner of the Award as Sweatshop's sponsorship of parkrun formally comes to an end. So there is a twinge of sadness attached to this occasion, knowing we will no longer be nominating any of our many excellent parkunners, there will be no more monthly mulling over of worthy candidates, no further reviewing of who's done what to contribute their time and effort to our wonderful weekly event. However, being one of the oldest parkruns in the world, we can say that we've been lucky to yield a long roll-call of Sweatshop winners, and for the final time we thank Hugh Brasher and Sweatshop for their fantastic support over the years.